Fast Ship and Special Saving Colors are Black, Light Grey, Silver Grey, Sand, Chocolate, and Sparrow Blue Paloma. All other Paloma colors are special orders. Introducing the Stressless Admiral Recliner on sale, but only for a limited time! Ekornes is world renowned for creating furniture that is sturdy, beautifully designed, and amazingly comfortable! The Admiral Recliner is a true classic that will make a wonderful addition to an already extensive line of amazing recliners. The Admiral Recliner has the ability to swivel a full 360 degrees, recline, and has a headrest that can be adjusted for maximum support and comfort. High quality is a key aspect when Ekornes designs furniture! Ekornes is so sure of the fantastic quality of the Admiral Recliner, that they back it with a Ten Year Warranty. To view more information about the Ten Year warranty, simply click on the Warranty Details tab above. 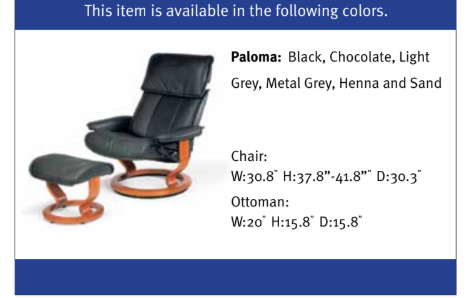 The Stressless Admiral Medium Recliner and Footstool is available at a fantastic price in Six Paloma Special Colors. The Six beautiful colors includes Sand Paloma, Light Grey Paloma, Silver Grey Paloma, Sparrow Blue Paloma, Black Paloma, and Chocolate Paloma. Sand and Chocolate Paloma are two of the most popular leather color choices and look fantastic in almost any home! To view these six beautiful paloma special colors, simply use the pull down menu above, which is titled: "Select Leather or Fabric Type and Color". Once you have completed your order of the Medium Admiral Recliner or any of the other amazing Stressless Recliners, you will receive an email confirming the details. Our dedicated Customer Service Team will typically follow up with you by phone within 1 business day to confirm your order and provide you with an ETA. Our Ekornes Specialists will also do a “double check” to make sure you are receiving the lowest, discounted pricing available. Take the Comfort test at an Unwind location (or the Stressless store closest to you) and experience the difference a Stressless Recliner likes this makes. Lets briefly discuss the "Comfort Test": It primarily consists of probing questions everyone should ask themselves before buying a Stressless sofa or recliner to make sure the model is a "perfect fit" for you. Can you see directly in front of you? If the headrest is too large for you, you may feel as if your head is being pushed forward. If it is too small, you may notice there is not enough head support to see the TV in front of you with ease. Stressless technologies are designed to provide adequate support in specific sizes so that your head and neck never have to strain or struggle. Choose PayPal Credit for their flexible payment options and familiarity when purchasing the Stressless Admiral Medium Recliner and Footstool. Finance your purchase , relax with flexible simple payment options and pay the balance off over time. Remove the pressure of shopping and truly relax and unwind. Easy Payments with PayPal Credit lets you get the comfortable Stressless Furniture when you want it, and budget your payments as you go. You can choose the monthly payment amount and the length of time that works best for you. After all, who know you better than you? Pay with peace of mind. PayPal will notify you when each monthly payment is due, so all that’s left to do is sit back, relax, and enjoy your purchase. Still have questions about the wonderfully unique Stressless Admiral Recliner, or have questions about any of the other amazing Stressless Products offered through our website? Call 888-486-9463 to speak with an Ekornes Furniture Specialist. They are available to answer all questions and offer guidance in finding the perfect Stressless furniture for any home!